The NWHL’s explosive return to action this weekend saw too much greatness to be limited to just one VEDA Player of the Week. So we have two. 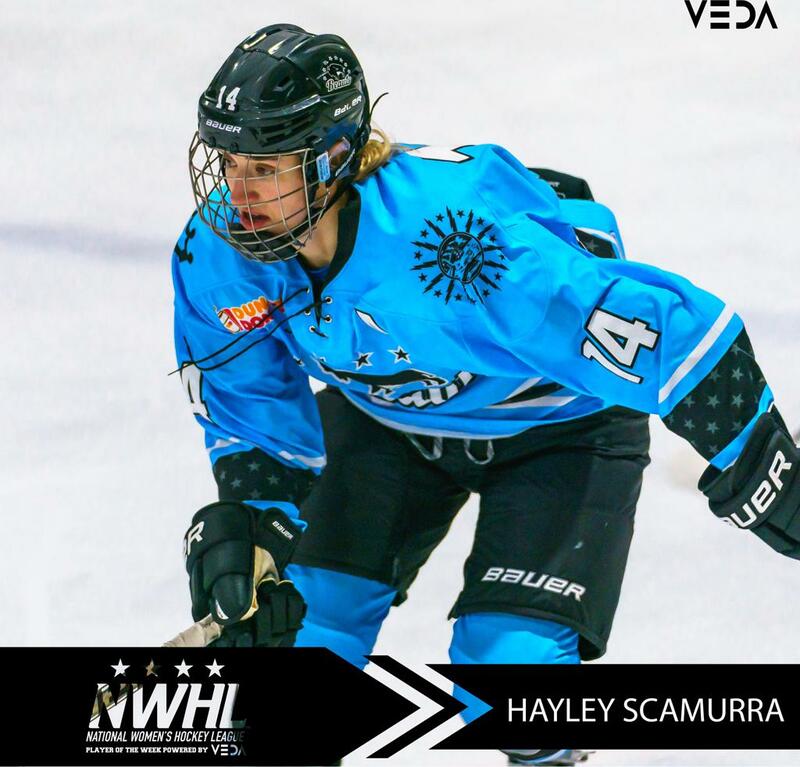 Congratulations to Hayley Scamurra of the Buffalo Beauts and Meeri Räisänen of the Connecticut Whale for their splendid performances that led to their selections as the VEDA NWHL co-Players of the Week. For Scamurra, the exceptional forward whose development continues to warrant National Team attention (hello?! ), she has been here before. On Sunday, she scored a goal and added three assists in the Beauts’ 5-2 win in Boston. Scamurra leads the NWHL in scoring, with 5 goals and 7 assists for 12 points. Here’s more from Scamurra on being named one of the VEDA Players of the Week. 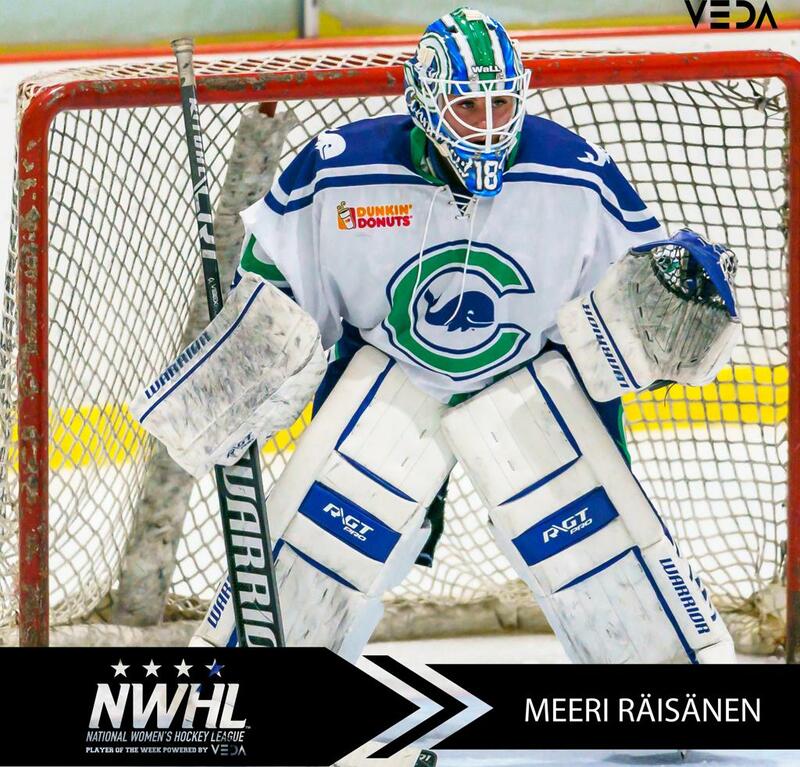 For the rookie Räisänen, she has been spectacular all season, but in Newark on Sunday she shut the door so completely, it resulted in her first career NWHL victory and the Whale’s first win of the season – a 2-1 triumph over the defending Isobel Cup champions. Räisänen stopped 27 of 28 shots, with many of her saves followed by scenes of Riveters shaking their heads. Here is NWHL game analyst Erica Ayala post-game in Newark breaking the news to Räisänen that she is one of the VEDA Players of the Week. The Riveters get another shot at Raisanen and the Whale this coming Sunday when they host the rematch at RWJBarnabas Health Hockey House in Newark. Fans are encouraged to order their tickets for this special Thanksgiving weekend game now at NWHL.zone/tickets before they’re all gone. Stay tuned each Monday for the announcement of the VEDA NWHL Player of the Week.